Is There ANYTHING That Could Persuade These People BHO is a Bad President? This is funny enough, I suppose. But I do wonder if all the people who said, "Obama has to wait until after the election. Then....THEN he'll start doing the right thing!" still believe that. At some point, you have to recognize that OBAMA is the zombie. Financial journalists are like NFL cornerbacks. They have a very short memory. No matter what happens, they always have a facile explanation, and little to no concern if the explanation is logically consistent with the explanation for yesterday's events. I read that the stock market decline yesterday was due to "preliminary bad jobs news" and "bracing for Friday's jobs report". If the market had surged, it would have no doubt been because the bad news meant the Fed would not be ending its various asset buying programs (the "bad news is actually good news" gambit). And people, if the market hadn't budged........?? That's right, investors had already "priced in" the news. Nice work if you can get it and don't mind the smell. Ouch! 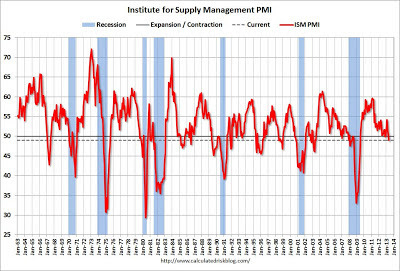 This morning's ISM report on Manufacturing activity was bad. A reading of 49 (below 50 indicates contraction), the lowest since mid 2009. 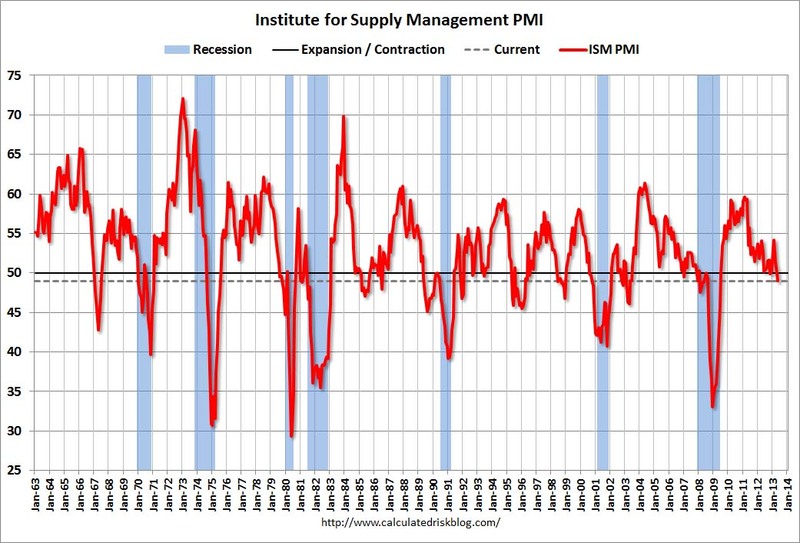 Plus the recent ADP jobs report indicated that 6000 manufacturing jobs were "lost" in May. Come on Service sector! Only you can save us. Don't Try to "Fix" It, Okay? I just need you to LISTEN, sometimes. Apparently, "we theorize that...." means "I thought of this in the shower, and had the data, so I figured what the hell!" Abstract: Despite much public speculation, there is little scholarly research on whether or how ideology shapes American consumer behavior. Borrowing from previous studies, we theorize that ideology is associated with different forms of taste and conspicuous consumption: liberals are more drawn to indicators of "cultural capital" and more feminine symbols while conservatives favor more explicit signs of "economic capital" and masculine cues. These ideas are tested using birth certificate, U.S. Census, and voting records from California in 2004. We find strong differences in birth naming practices related to race, economic status, and ideology. Although higher status mothers of all races favor more popular birth names, high status liberal mothers more often choose uncommon, culturally obscure birth names. Liberals also favor birth names with "softer, feminine" sounds while conservatives favor names with "harder, masculine" phonemes. These findings have significant implications for both studies of consumption and debates about ideology and political fragmentation in the United States. I liked this far more than I should have, I expect. Not sure I actually believe this. But, here you go. "What he and his fellow researchers discovered (here’s a PDF of their paper) is that most games of chance involving coins aren’t as even as you’d think. For example, even the 50/50 coin toss really isn’t 50/50 — it’s closer to 51/49, biased toward whatever side was up when the coin was thrown into the air. But more incredibly, as reported by Science News, spinning a penny, in this case one with the Lincoln Memorial on the back, gives even more pronounced odds — the [American] penny will land tails side up roughly 80 percent of the time." Like causes produce like effects, in politics as in physics. President Obama gives the same answers President Nixon gave, and for the same reasons. Once the President decides that illegal acts, if done by the President, are legal, simply because the President is doing them, you have become Nixon. Amazing that Bob Schiefer, poor old guy, is the one who points this out. Wow. 1. Victory through commercial sponsorship? : "The United States might not be the most popular country in the Middle East these days, but in addition to Chevrolet, [Arab Idol's] sponsors include Pepsi, Twix and Kentucky Fried Chicken"
2. It's really BAD that a Chinese company is buying Smithfield Foods, because....well, because it's really BAD! 3. France worried that it will be swamped by English-speakers, because it is losing out on English-speaking students because it is so aggressively obnoxious to English-speakers. Just reading this makes you realize how justifiably worried the French are to be French. They are headed to a hard-earned and well-deserved irrelevance. 4. Capitalism: Laugh track, or last laugh? 5. Prof. Fisher of Yale replies to socialist Stokes, on disappearance of interest rates. 6. The folks at SCOTUS show a "remarkable outbreak of harmony." 7. A man who takes spelling VERY seriously. 8. US Political Polarization, Duke study. 10. Come the revolution, we won't need no stinkin' religion! 11. Ripped from the pages of Atlas Shrugged: I would not have believed this, but it's true. 12. Gun Free Zone App: really? 13. Could Anonyman's generation be any more self-absorbed and solipsistic? Answer: No. Some evidence. 14. Taylor Swift bought a giant beach house, and walked around downtown, in the LMM's hometown. In Westerly, this is the biggest thing since Roughie threw that putter through a car windshield. Heck, maybe bigger. 15. NASA seems to be dealing with the sequester just fine! 16. Scott Adams delightfully trivializes P-Kroog. 17. Peak Oil is peak idiocy, more idiotic every day. Look Ma: I just fixed Social Security! Want to do it your way? You can use this cool app. And, as always, you can tell me why I'm a dope in the comments. Labels: problem solved, social security, would you like to play a game?